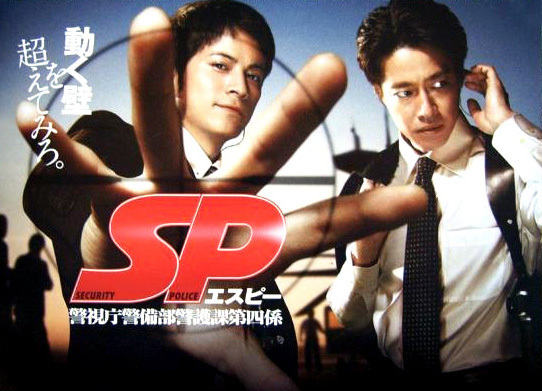 Kaoru INOUE (Junichi Okada), 25, is a new SP (Security Police officer trained specifically to protect VIPs) who has special abilities such as photographic memory, tracking ability, etc. He witnessed his parents being killed in terrorism against a politician when he was a little boy, which made his five senses extraordinarily sharp. Acknowledging his unique abilities, Soichiro OGATA (Shinichi Tsutsumi), 38, recruits him for his team and allows him to act depending on the situation. The crimes and terrorism are much harder to deal with in this internet era. With Ogata's superb leadership and Inoue's unique abilities, Ogata's team prevents crimes against VIPs and saves lives. When they are assigned to guard the Prime Minister, Inoue has to overcome his trauma and Ogata may have to reveal his secrets. Kennedy Rose Apr 17 2015 9:55 am stumbled on this drama quite accidentally(am taking a break from korean dramas and thought of starting on j-dramas again- for variety's sake). and what a great 'accident' that turned out to be. and yes, i am groaning and moaning about so few episodes(this kind of drama should go for at least 20 episodes). ok, ok..so it has a special and 2 movies..but still.. anyways, this is one awesome drama! great acting, great actions, the cases are great(love the hospital takeover case!).. there's ample of humour and there are few scenes that can bring tears to your eyes. two thumbs up and highly recommended! the only thing that made me yelled in frustrations is the fact the security team can't act without approvals from the higher ups and why on earth can they fire their guns when the situations call for it? waiting for green lights too? augh! but don't let that deter you from watching this. now, i am really interested in junichi okada's other projects! Yugo Mar 30 2013 8:57 pm WHat a surprise I had! Great acting, and cinematography - espescialy the close up wide-angle shots. Fantastic blend of drama, action and oddball humour, and I felt tense at times, and occasionally moved. I think action fans will find this startling different, and enjoyable. RyujiAoi Aug 10 2011 3:14 pm I really enjoyed SP and hate to see it end! It had lots of action, excellent acting, sympathetic characters, great plots and subplots, and a good dose of humor. I highly recommend it to fans of the genre, of the various actors, and of Jdrama/Asian drama in general.